Once again I have the honor of playing in the Ronald McDonald House Hockey Challenge. This is an annual event put on by the Seattle Thunderbirds and the Ronald McDonald House of Western Washington and Alaska. If you don’t know what the Ronald McDonald House is all about, you should. The Seattle Ronald McDonald House is a home-away-from-home for 700 families each year while their seriously ill child receives medical treatment at Seattle Children’s Hospital. Some families stay for nights, some for months. The House is a warm, supportive and safe place during a very difficult time. Over the years I’ve met with families and discussed their stories and I can tell you it is one amazing charity that has a real impact on people’s lives. 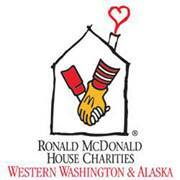 The purpose of the Hockey Challenge is to raise money from the RMHC. This is one of the greatest hockey events we have in the area and I would like to get this great community involved. I am willing to match up to $1,000 of whatever is contributed in the next two weeks. As a bonus, if I can get over 100 donors, I will be putting in an additional $500. If I can get 100 people to put in just $10, I will match $1,500. Let’s make it happen. The Hockey Challenge is held on February 21st at ShoWare Arena in conjunction with the Seattle Thunderbirds-Everett Silvertips game. After the Thunderbirds game, a group of all-stars will take the ice for a fun game between local celebrities, former Thunderbirds and some former NHLs. I will be one of the pylons in the all-star game watching the former NHLs skate circles around me.